Some of your favorite craft beers started with homebrewing. People who know and love good beer see it as a chance to get creative and try something new, all in the comfort of their homes. Designing a creative space can be anything you want it to be and setting it up is part of the fun! If you love craft beer, you may have considered homebrewing at some point in time. Can you even consider yourself to be a fanatic if you haven’t at least thought about trying it? It’s likely that some of your favorite craft beers started with homebrewing. People who know and love good beer see it as a chance to get creative and try something new, all in the comfort of their homes. Not all of us are looking to start a brewery, but the opportunity to create something we love is something everyone hungers for. There’s nothing more satisfying than the pride of a job well done. If you love beer and you crave that sense of accomplishment, homebrewing is for you. So you’re in. You’ve done a little research and you’re ready to set up a space to make this happen. Let’s walk through the steps you’ll need to consider to make your creative space one you’ll never want to leave. Every great project starts with one crucial step: making a budget. To do so, first you’ll need to price out the equipment needed to home brew. Luckily, home brewing isn’t a particularly expensive hobby and you don’t need a ton of fancy equipment to make something worth drinking. Once you’ve priced out the actual equipment you’ll need, then you can start the designing which will force you to think through both the functionality of your space and the fun side that will help others enjoy it, too! One of the best ways to set a solid plan is to spend time in spaces you admire. The next time you’re in a brewery or pub that you particularly enjoy spending time in, think through what attracts you to that place beyond what’s on tap. If you love the layout, the furniture, or the color scheme, be sure to take note and find ways to incorporate that in your own creative space. Certain colors bring out certain moods in each of us. The colors you choose for your walls and decorations can make your space feel big, impact how happy you’re feeling and even give you energy. If you need to feel at ease to create, cool colors such as blues and greens will work well in your space. If you find that you’re often tired and in need of some energy, warm colors like yellow and red can help with that. Think through your needs and find colors that compliment them. If you want more than one color, think about using basic color theories. Monochromatic colors are similar in color, but differ in saturation and sometimes finish. Analogous colors are 3 colors paired together that are similar to each other. Complementary colors are those that contrast with each other, for instance, warm and cool colors. Once you’ve taken care of this step you can start decorating and personalizing which is why it’s important to have a good base to set the tone. 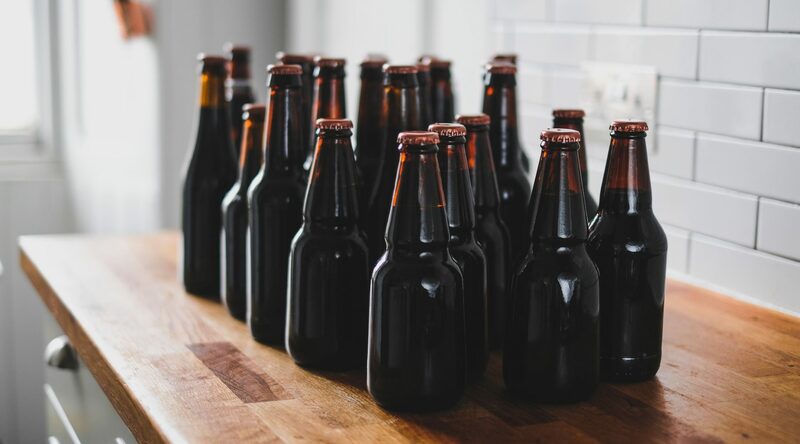 Homebrewing requires you to buy a lot of supplies and chances are the more time goes on, and the deeper you get into your craft, you’ll acquire more and more supplies along the way. That being said, it’s important to set your space up as if you already are overwhelmed with supplies so you can make a plan for when that happens. Many homebrewers swear by bins and large shelving units as a crucial part of their space’s functionality. It will help get things you’re not using at the moment out of the way and organized according to when you need it. Beyond just organization, you’ll want to set up your equipment in a way that makes sense and helps you avoid fumbling around. You’ll find that when homebrewing, the most time-consuming part is the preparation. Be sure to set yourself up for success by taking this into account and finding ways to save time. The best part about designing a creative space is that it can be anything you want it to be. The process of setting up is part of the fun, so take your time and enjoy it. Once it’s over, you’ll be ready to dive in! About the Author: Haley loves beer and traveling, and she loves writing about them both. Watching an Arizona sunset with a stout in hand is one of her favorite ways to wind down for the day. These artists took “DIY” artwork to a whole new level with great beer artwork. Valentine’s Day is coming up and the best gift to give is the gift of beer. However, make it special with these personalized Valentine’s Day beer labels!